Both of these films are adapted from Andrew Hodges' biography Alan Turing - The Enigma. And they both focus on the same three periods in Turing's life: his childhood friendship with Christopher Morcom, his work at Bletchley Park on cracking the Nazi Enigma code and his arrest and prosecution for homosexuality. Like a communique from a German U-boat, a biopic is a cipher of reality. You dial the wheels of the machine to a particular setting, feed in the details of a real person's life, and out comes an encrypted version of the truth for the audience to decode. How do the two versions of Turing's life compare? To crack the code, we have to examine how each film sets the critical wheels in the great man's life. Both films depict Turing as a socially awkward introvert, more interested in ideas and machines than people. But where Cumberbatch's Turing is an arrogant and detached cipher, disparaging the ability of others to understand his work and otherwise running afoul of office, national and personal politics, Jacobi's Turing is an accessible and enthusiastic advocate for his ideas. Throughout Breaking the Code, Turing engages in long asides on his critical ideas of decidability, computable numbers, patterns of biological development and the capacity of machines to mimic human thought. His worst habit seems to be failing to notice that people he's talking to have completely lost the thread of his often very complicated rants. The Imitation Game is less interested in elucidating Turing's ideas than it is in depicting his struggle to gain acceptance for them. Cumberbatch's Turing is terrified of socialization. Social interaction is a puzzle to him, a code or a cipher for which he lacked any sort of reliable crib. What people say is not what they mean. Other people seem to understand that, but Alan can't. Cracking the social code is a bigger challenge to him than defeating the Nazis. Jacobi's Turing isn't afraid of socialization. Rather, he's dismissive of it. Social niceties aren't intimidating to him. They're just irrelevant noise. The impact of his anti-social tendencies on others is the central source of dramatic conflict in The Imitation Game. In Breaking the Code it is commented on, but never really shown. Both films depict Turing's childhood crush on Christopher Morcom as a defining chapter in his romantic development. The Imitation Game explores the breadth of this relationship. We see the relationship begin and develop between the boys to the point where young Turing realizes he has fallen in love with Christopher. When he learns of Morcom's death, he struggles to cope with the loss while (not so successfully) trying to hide his feelings from the world. For the man who would spend his life solving problems of logic, this was one contradiction he could never adequately resolve. Where The Imitation Game goes for breadth, Breaking the Code emphasizes the depth of their friendship. The Morcom chapter gets only a single scene, but in it we see Turing's romanticism come to bloom as he fantasizes about inheriting his mother's house and living there with Christopher, working on math and science and otherwise exploring the hugeness of Creation. In this rendition, Morcom becomes a kind of romantic ideal that Turing tragically splits across Arnold Murray and "Pat Green" (Joan Clarke) later in his life. Both films depict Turing's desire to believe that Christopher's mind could have lived on past his death as the basis for his inquiries into machine intelligence. In The Imitation Game, the code breaking machines and later digital computers that Turing builds are named "Christopher." Breaking the Code also uses this chapter to introduce a character missing from The Imitation Game: Alan Turing's mother, Sara. The sweetly comic relationship between Alan and his mother infuses Jacobi's Turing with greater warmth than Cumberbatch's colder, more distant version. Joan Clarke appears in The Imitation Game as herself. In Breaking the Code, she is fictionalized as "Pat Green." The Imitation Game's Joan Clarke has more agency in the story than Breaking the Code's Pat Green. Keira Knightley's Joan is a tough-minded, independent modern heroine who provides Turing with the necessary insight to crack the social code and become a more effective leader of Hut 8 (the division of Bletchley Park which he led.) 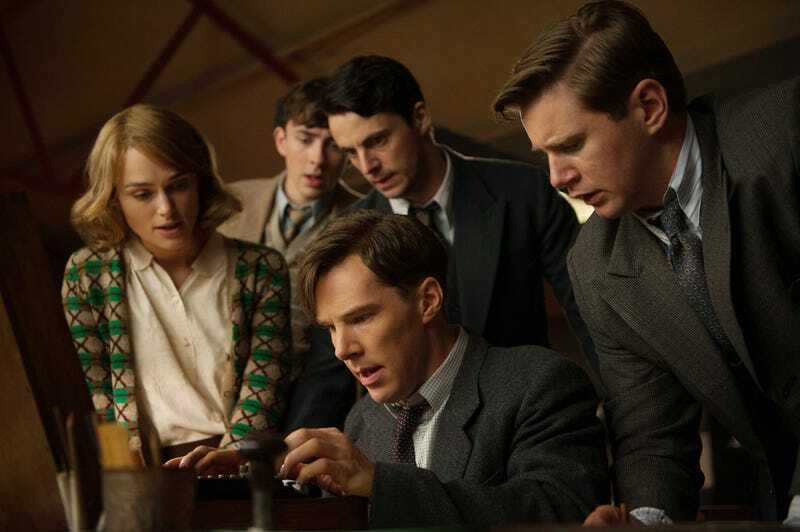 Time and again in The Imitation Game, connections are made between Turing's awkward attempts to connect with Joan and the other members of the team and his breakthroughs in developing the code breaking machine. When Turing proposes marriage, she accepts. When he later confesses his homosexuality, Joan takes the news in stride, confiding that however imperfect a husband he may be, Alan would still be better for her than any man who would expect her to be a perfect wife. In Breaking the Code, Pat Green is depicted as a counterpart to Turing and a female version of Christopher. Like him, she is shy and withdrawn, more passionate about ideas than people. Her pining after her colleague is as tragically impossible as Turing's own doomed romantic ambitions. In this version of the story, there is no engagement, and Alan keeps Pat purely as a friend. He rejects the notion of a bearded marriage out of hand. The Imitation Game goes into greater detail on Turing's time at Bletchley. The bulk of the film centers around the development of the "Bombe," a mechanical device capable of searching the vast space of potential Enigma settings for the combination that produced a particular cipher. From the beginning, Turing is depicted butting heads with the Government Code and Cypher School (GC&CS), particularly with Commander Denniston, awesomely played in full Tywin Lannister Mode by Charles Dance. Turing struggles to gain acceptance for his idea of mechanical codebreaking, pushing back against the resistance of his colleagues and ultimately end-running Denniston and going straight to Winston Churchill to appeal for resources. In Breaking the Code, Turing is recruited to Bletchley by Alfred Dillwyn ("Dilly") Knox. The overall tone of this chapter is much more jovial. The problem is laid out and the stakes made clear, but the process of breaking Enigma is not gone into in any significant detail. Turing's social problems at Bletchley, including the upset caused by his letter to Churchill, are not dramatized but are covered in conversation with Dilly Knox, who advises Turing on the joys of closeted living. Alan Turing's homosexuality came to light when he reported a burglary committed by an associate of Arnold Murray, a young man he was seeing. Turing reported the burglary and, after initially trying to hide the nature of his relationship to Murray, finally admitted to police that they'd been having an affair. Cumberbatch's Turing is acutely aware of the danger homosexuality poses for him. The stakes involved in stepping out of the closet are made crystal clear. And so The Imitation Game side-steps the fact that it was Turing who called the police to report the robbery and it was Turing who gave the police the information about the affair. Cumberbatch's Turing plays his cards close to the chest, so it would seem out of character for him to cooperate with an investigation of his life, much less instigate one. Jacobi's Turing is much more at ease with his sexuality. He has a naive, almost childlike faith in openness and candor. He is so uncomfortable with lies, so sure that the England he loved would always protect him and so unwilling to live with contradictions, that he simply cannot help but give the police the information they need. When talking to the police, Cumberbatch comes off like a combination of Hannibal Lecter and the Doctor from Doctor Who, as if he's holding all the cards in a game the police aren't even playing. Jacobi, on the other hand, comes off like an awkward school boy caught in a lie. For Jacobi's Turing, homosexuality is part of who he is. We see his relationship to Arnold Murray develop and witness the tragic, human frailty of a middle-aged man falling for a young hustler and then running afoul of the authorities. Jacobi's Turing would rather pretend he lives in a world that is just and reasonable than live the lie that is expected of him. For Cumberbatch's Turing, homosexuality is just another problem, another contradiction, another bad setting on his inner Enigma that keeps him from connecting to the film's love interest, Joan Clarke. He harbors sexual, but not romantic, feelings toward men. With the exception of Christopher Morcom, we never see Cumberbatch's Turing express sexual or romantic feelings for anyone. Of all the enigmas in Alan Turing's life, the most enduring is his death. On June 8, 1954, he was found dead of apparent poisoning with a half eaten apple at his bedside. The official cause of death was suicide, but Turing's mother (who wrote a biography of her son) always insisted it was an accident. She maintained that he had come to terms with his hormone treatment and was generally in good spirits, with much to live for. Her son, however, was a slob who had been playing around with potassium cyanide and likely forgot to wash his hands before going to bed. The Imitation Game unambiguously states that Turing's death was a suicide. The film plays down his sloppiness, showing only slight disorganization in his living space toward the end of his life, when hormone treatment made his mood unmanageable. Breaking the Code holds an ambiguous stance on the question, presenting both the official medical conclusion and the mother's intuition. This ambiguity is apt. One of the criticisms of the Turing Test as an indicator of machine intelligence is that it ignores intentionality and cognition. It doesn't matter how a Turing chat bot arrives at an answer, so long as it behaves convincingly human. Alan Turing bought poison and ingested it. Whether he intended to or not might be a question that Turing himself would regard as pointless to ask. Which of the two renditions is the better? Which is more true to the real Alan Turing? In his other seminal role as the emperor Claudius in I, Claudius, Jacobi is asked which of two historians he preferred, Pollio or Livy. Claudius responds that he prefers Livy for beauty of language and Pollio for interpretation of fact. When it's pointed out that the answer pleases neither of them, Claudius responds that he wasn't trying to please, just tell the truth. The truth is that neither film presents anything like a complete picture of Turing. Neither film captures the eccentric "Prof" who wore a gas mask to work to avoid hay fever, the avid athlete who became a world-class marathon runner in his spare time or the testy programmer who became annoyed with colleagues who pointed out bugs in his universal machine programs. For an overview of Alan Turing's importance to history and the monumental injustice done him, The Imitation Game gets the nod. While it oversimplifies many elements of the true story, The Imitation Game never takes its eye off the historical significance of its subject. For a richer rendition of Alan Turing's actual ideas, of the awe he held for mathematics and the tragic, human story of his fall from grace, the medal goes to Breaking the Code. Jacobi's renditions of Turing's ideas on the computability of numbers, the logic of cryptography and the possibility of machine intelligence are positively mesmerizing and his heartfelt, exquisitely lonely Turing is warmer and more accessible than Cumberbatch's Sherlock-like psychopathic mastermind. Watch The Imitation Game to learn how Alan Turing saved the world. Watch Breaking the Code to learn more about the world he saved. The Imitation Game is currently in theaters. Breaking the Code is available on YouTube.